We offer more ENERGY STAR® systems than ever. ENERGY STAR Systems incorporate eco-comfort technology, dual and triple-allergen filtration, and whisper-quiet operation. New technology revolutionizes the heat pump. Space-saving design means easy and unobtrusive installation. We offer more ENERGY STAR systems than ever, and we’re the industry leader. Energy Efficient Ductless Air Conditioning. We have Energy Star rated systems with dramatic increases all the way up to 26 SEER. Our units incorporate eco-comfort technology, dual and triple-allergen filtration, and are whisper-quiet. Eco-comfort technology makes these systems smarter in how they use energy and minimizes their impact on the environment. Plus, there are many advanced features like the i-see™ Sensor, that automatically detects room temperature differences and adjusts for greater comfort. Mitsubishi Electric’s advanced multi-stage filtration systems dramatically reduce allergens and help eliminate odors. Our indoor units operate with sound levels starting as low as 19dB(A), quieter than a human whisper. 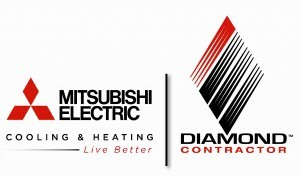 Mitsubishi Electric offers the most technologically advanced heat pump systems in the world. 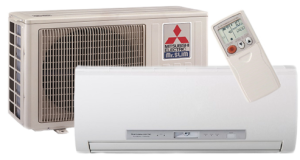 Unlike older, inefficient heat pumps, there is no cold air delivery with Mitsubishi Electric’s Cooling & Heating systems. The Hot StartTM system doesn’t activate the fan until the desired temperature is reached, so it never blows cold air. Select models use Hyper-Heating INVERTER (H2i®) technology that operates effectively down to -13º F. These models give true year-round comfort from a single system. These units provide easy installation, simple service and longer warranties. Although, with our industry-leading reliability record, you won’t have to worry much about that. Better yet, we’ve extended our warranties to seven years on compressors and five years on parts. Live. Work. Play. In total comfort. Mixed-use buildings are some of the most challenging buildings to keep comfortable. With the wide variety of environments – from retail to office to living – the cooling and heating needs of a single building can be significant. Indoor units come in ducted and ductless variations and are designed to be placed just about anywhere you want in your interior spaces. Our ductless configurations free up valuable interior space so you can increase ceiling height or even get more usable floors without increasing your building envelope. And, our ducted systems have a low profile, reducing the amount ceiling space required to conceal the systems. Condensing units have a wide range of capacities depending on your needs and can utilize a number of cooling and heating energy sources. They are compact, quiet and simplify system design. Whether you are building from the ground up or renovating an existing mixed-use building, Mitsubishi Electric Cooling & Heating provides you with the solutions that effectively and efficiently perfect the comfort of indoor environments.